We took a little drive today. Jim normally would have been working but we all caught colds and his worse day was today. He resisted the idea of calling in sick but knew he could not function as he was. So, after a good long night of sleep we took a little drive and got some ice cream. 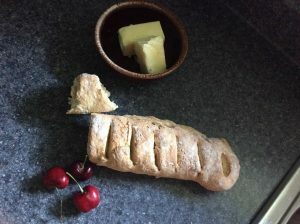 When we got home Andrea had made fresh bread for us. Yum! At the end of this week we will spend a few days with many of our kids camping in southern Ohio. I have a feeling we will all be a little rowdy, crazy and I’m hoping we will not offend those camping nearby. One thing about our family – we are many! The other things are those mentioned – crazy, loud, annoying, and we all love to eat. One thing that Chelsie, Hillary, Lois, Jesse and dad have spent a good deal of time talking about as we made plans for our trip was food. We are going to do all our cooking in the great out of doors and every meal and snack has been planned. I can’t wait to be together and love on all my kids and grandkids. I want to see their faces, look deeply into their eyes and try to find out for sure how they really are. I want to tell them I love them and find new things out so I can pray for them and encourage them. I am a little surprised how fast the summer if flashing by. I’m already imagining the cold days of winter and wondering how the Lord will supply and direct. More to follow about the great Evans’ Family Adventure in Ohio.